As a family law attorney of 27 years, I have come to realize that it is important for clients to have an attorney who has experience. When you are selecting an attorney, it is important to find out how much experience that person has. It is important to explore how much experience they have with the type of case you are interested in retaining them to represent your interests in. Simply because an attorney has 20 years of experience doesn’t mean they are qualified to represent you in all matters or areas of law! All 24 years of my experience has included representing individuals in family law matters such as divorce, separation, child custody and parenting time. Attorney will expect you to ask them about their experience during an initial consult and you should. 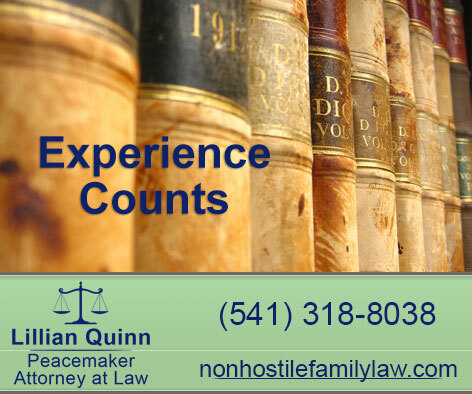 Sometimes, attorneys practice in several areas that are unrelated to the family law case you’re inquiring about. If the attorney you are interviewing is a criminal law attorney then hiring them to do your divorce may not be such a great idea. Why? If the attorney’s experience is dealing with criminal law and they do divorce on the side then it may be possible that they are not up to date with the latest family law statutes and case law. Our family law and child custody case law and laws change all of the time just like criminal law and case law do. For instance, Family Law recently changed to include gay marriage and numerous nuances relating to it. Spousal support never used to be on the table with gay couples and very recently that changed. An attorney’s experience is very important when it comes to the issues of your case. An experienced family law attorney knows how valuable it can be to collaborate and settle a case verses going straight to trial. Why? Expense for one. A trial can cost thousands of dollars and it often can take more than a year to have a Judge make any decisions. The Deschutes County Circuit Court docket is currently jammed and often can be a year or two before your case is heard. My experience allows me to pursue non-hostile alternate options that time and again have yielded more positive results than those cases that go to trial. Mediation, collaborative law and simply openly discussing the merits of a case from an experienced perspective often lead to better results for you and your family. People often overlook some costs of a divorce or separation. There will be costs for experts, taking time off work and of course the emotional cost can be devastating. An experienced divorce attorney can guide you to what a reasonable settlement should be and avoid going to trial. An experienced attorney knows and has worked with the other family law attorneys in the area and can give you a sense of your spouse’s attorney. I have used retired Judges to facilitate mediations when we are stuck on some issues with a lot of success. There are so many options of collaboration and cooperation rather than going to war with your spouse. In my view, everyone loses when people go to war, especially the children. Luckily, Deschutes County has some great resources such as a mediator who can work with parents on how setup parenting time and parenting overnights that will work for the whole family. If your case has issues that a Judge must decide, then there another faster option available is to go to informal trial. Your experienced lawyer can help guide you through one of these trials and it is often a better choice than a traditional family law trial when considering cost and time. It is important to have an attorney you trust and that begins with the initial consultation. It is a smart idea to interview more than one attorney so that you feel comfortable with whom you are working with. Remember, it the attorney/client relationship breaks down, speak directly with the attorney and chose another lawyer if the case calls for that. Divorce is an emotional time for people and it is essential you hire a family law attorney with experience who is caring and compassionate as well.